You can't imagine how much I was waiting to play this. Wasn't dissapointed at all. Game Over menu is a bit difficult to use due to the mouse being invisible. 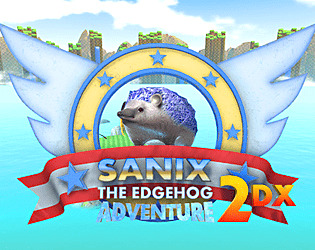 An option to have a fixed camera behind Sanix all the time would be great. Something you can toggle on and off during the game. Also got the negative lives bug. Somehow managed to clip Sanix through a platform and made him land on the ground below on his side. It wasn't game breaking (as soon as I made him walk he got on his legs again) and it was pretty hilarious, so is probably not worth fixing it. I lost it when Live and Learn started playing. Also that 1-Up on the platform that you can't return from in Marble Zone at the beginning was nice. why is this so good. This was fun as hell, the character models and the level look really cute, it's also pretty challenging, most of the enemies moves toward you and it's pretty complicated to jump over them sometimes (mostly that flying robot thing) the boss wasn't easy either. The only bug that I found was that I died on the second level on the lava and restarted with -2 lives, dying again would give me -4 and then -7, I didn't really understand what was going on. I don't quite know how to critique this. It's clearly a hot meme game, and it's effective at being dank, but as a platformer it's completely non offensive and functional. If you want to improve on the gameplay, have not sonic have some momentum to him, and add a roll or some sort of spin dash.